Fire point stand (fire cabinet) should certainly present on the territory of any enterprise and public place. Wooden or metal, different sizes and performance. Obligatory condition is only the presence of fire-extinguishing appliances in working condition and easy access to them. The owners of private houses should think about this example. Fire security should be provided by any possible way. There should be taken whole package of measures beginning from air pollution sensors to fire extinguisher storage: not only inside but also outside. It can save lives and protect your property. 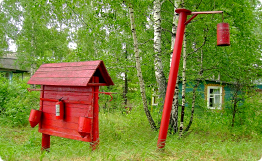 Outdoor fire point stand is no less important element of fire extinguishing which will allow a person situated outside to take fire extinguisher and in case of inflammation (sound and light signal on the front of the house) to break a window, for example, and fight a fire. More often these stands are bought already equipped; there also exist variants when you make them by your hands. On the market you can find opened and closed fire point stands, with net or plain doors. The main thing is to have the possibility to place there one or two carbon dioxide type fire extinguishers. All the rest standardized for enterprises - pike pole, shovel, bar, fire-arresting sheet, hatchet and buckets – can be neglected. 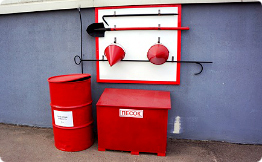 You can buy carbon dioxide type fire extinguishers which are placed on outdoor fire point stand addressing to managers of Group of Companies «Terrikom». We wish you safe everyday life and leisure.